Home / Big East Conference / St. John’s upsets Duke in triller at Garden. St. John’s upsets Duke in triller at Garden. 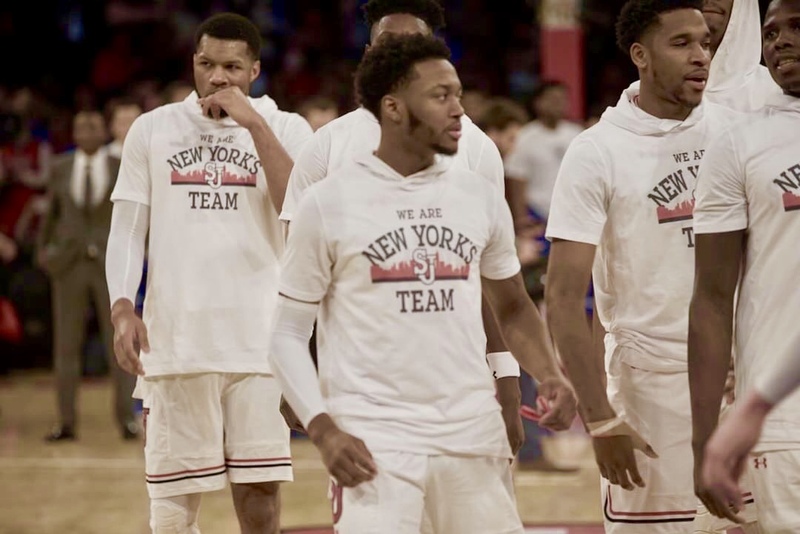 NEW YORK CITY, N.Y. – The St. John’s Red Storm (11-13, 0-11 Big East) hosted the No. 4 ranked Duke Bluedevils (19-3, 7-3 ACC) in a nationally-televised matchup held at the worlds most famous arena, Madison Square Garden. This game would honor Howard Garfinkel, the legend and founder of the iconic Five Star Basketball Camp who passed away in 2016 at the age of 86. Despite having a 10-2 non conference record heading into the Duke game, St. John’s hasn’t had the success they had wished for this season. They have lost their last 11 games versus Big East opponents and having Duke in town is not the best moral booster. This game would probably be the biggest test the Johnnies were going to have this season and they would need to play a perfect game if they wanted to come out with a victory. St. John’s came out the gate focused and didn’t seem phased by the National powerhouse coming to town. Duke came out firing in the first half led by Gary Trent Jr’s hot start. St. John’s managed to force Duke into 12 first half turnovers, which was a good sign for the rest of the game. The Johnnies looked confident and played with heart and plenty of emotion. Both teams were consistent early on and the game remained close heading into halftime with Duke having a slight lead of 39-32. Led by Shamorie Ponds and Bashir Ahmed’s shooting, the Red Storm claimed its first lead early in the second half. Their hot shooting carried them to a 10 point lead with about 6 minutes left in the game. The game turned into a slug fest with Duke’s Trevon Duval hitting a clutch 3 and scoring on a couple of easy layups, which cut the St. John’s lead to 4 with under 3 minuets remaining. As the game got down to the closing moments the pressure mounted. Throughout the game, Shamorie Ponds did whatever he wanted to do on the court. He controlled the pace and was practically unguardable. The sophomore point guard was recognized before the game for scoring 1000 points in his collegiate career and added a game high 33 points to his total. Duke’s Coach K praises Shamorie and said “He’s as good of a guard as we’ve seen all year”. This is very respectable considering Duke playing in a very competitive conference, the ACC. With the game in the balance, Duke’s Marvin Bagley forced a St. John’s turnover and kicked the ball to Gary Trent for a clutch 3 point shot with 2 minutes left in the game, bringing the game to a one point difference. St. John’s held that narrow 1 point lead when Ponds hit a 3 from NBA range with the shot clock winding down. The sold out Garden erupted in cheers. Before the crowd could settle down Duke’s Grayson Allen also hit a three pointer, leaving only a few seconds on the clock. St. John’s turned the rest of the game into a free throw contest and escaped with the upset victory. Duke got a good look at the end of the game but the shot didn’t go down. Shamorie Ponds led all scorers with 33 points, with 24 of those points coming in the 2nd half. Tariq Owens and Bashir Ahmed both contributed greatly to the win chipping in 17 and 19 Points, respectively. The St. John’s Red Storm went to war with the Duke BlueDevils at the Garden. Photo Credit OvertimeTae. This was a huge win for St. John’s. Not only for their record but also for their confidence as well. They won the defensive battle, forcing Duke into 18 turnovers, which is uncharacteristic for that team. St. John looks to ride this momentum into their next few games. The next huge test for them is Villanova, who unlike St. John’s, has been on a hot streak in their last few games. Only time will tell how the Johnnies will respond the rest of the season. If this game is any indication on how the rest of the season goes they will be in good shape. Cal Griffin is a contributing writer for PureSportsNY.com. Feature photo credit Overtime Tae.